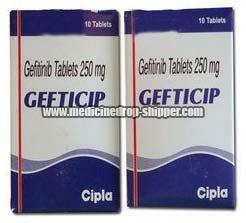 We are highly engrossed in supplying and exporting Gefticip Tablets. Gefticip Tablet is made by using gefi and it basically belongs to a class of anti-cancer medications known as epidermal growth factor receptor (EGFR) tyrosine kinase inhibitors. It is used for curing the non-small cell lung cancer. The medicine functions by blocking the action of a certain naturally occurring substance that facilitates the growth of cancer cells.